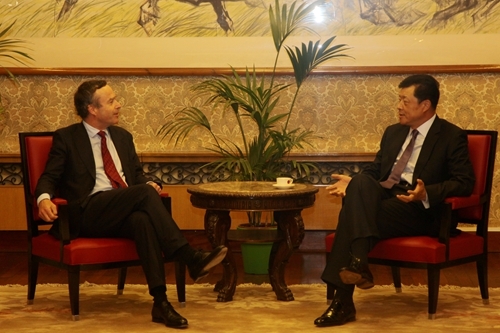 On 30 April, Chinese Ambassador Liu Xiaoming had discussions with Editor of the Financial Times Lionel Barber. Other participants included Foreign Editor Roula Khalaf, Comments and Analysis Editor Frederick Studemann, Emerging Markets Editor James Kynge, and Embassy Spokesperson and Minister Counsellor Zhang Yangwu. Ambassador Liu congratulated Lionel Barber on his successful exclusive interview with Premier Li Keqiang and said that the Financial Times is an important media in the UK and the world. China attaches importance to the long-term cooperation with the Financial Times and hopes the latter will report on China comprehensively and objectively, so as to foster better understanding of China among the Western public and help the world see the real and changing China. Barber appreciated the Embassy's support in the successful interview with Premier Li Keqiang. The Financial Times pays high attention to news coverage concerning China and will continue to follow China's development in all aspects and cover China more broadly. Ambassador Liu briefed his guests on the "One Belt One Road" initiative, pointing out that the aim of the initiative is to let more countries share in the opportunities and growth. China would like to strengthen practical cooperation with countries concerned and inject new vigor into the sustainable development of the region. Ambassador Liu suggested the initiative and the great opportunities it will bring to the UK and other countries could be a good subject for media coverage. Barber thanked the Ambassador for the comprehensive information on the initiative and said the Financial Times will keep close track of the initiative's progress and enhance relevant coverage. Ambassador Liu also shared with his guests China's position and views on China-UK relations, China-US relations and Hong Kong's political reform, etc.